Bulgaria Economic Forum is an NGO, founded by Bulgarian and International private companies, public institutions and business associations in 1998. It is an Association established under the Low for Non-Profit Entities of the Republic of Bulgaria. - facilitate and moderate the dialogue between the business and the public authorities. The General Assembly is the supreme body of the Organization and consists of all members (45 members in 2012). The Assembly gathers on year to year basis and sets the strategic goals and policies of the Organization. The Managing Board consists of 7 members elected by the General Assembly. The present Managing Board is elected in 2009 and has a 5 years mandate. George Tabakov is Chairman of the MB of Bulgaria Economic Forum since 2001. Previously he was Deputy Minister of Trade (1998-2000) and Chairman of Bulgaria Foreign Investment Promotion Agency (2000–2001). For more information about George Tabakov you may visit his Linkedin profile. Christo Drumev is a Member of the BD of Bulgaria Economic Forum since its founding in 1998. He was General Director of the National Palace of Culture from 1988 till May 2011. Since 1994 he is a founder and Chairman of Managing Board of Union of the Bulgarian Producers Made in Bulgaria. Member of the Board of Bulgarian Chamber of Commerce and Industry, Vice-president of the Supervisory Board of PFC Levski Spartak, Member of the Board of Directors of the Atlantic Club and President of Trust and Protection foundation. President of the Bulgarian Bridge Federation. Bozhidar Danev is currently Executive Director of Bulgarian Industrial Association. 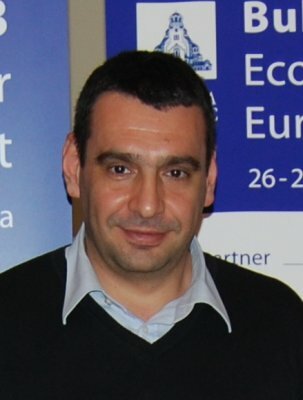 Martin Ganev was Executive Director of CSIF AD from 2007 to 2009. During this period he was also Chairman of the Board of Directors of Despred AD. He was First Deputy General Director of Economy and Finance at Lukoil Bulgaria EOOD (1999 – 2007), member of the Board of Directors of PIC Lukoil Bulgaria AD (2000 to 2008), member of the Board of Directors of Lukoil Neftochim Bourgas AD (2001 – 2002). From 1993 to 1999 he was Corporate Finance Manager at PricewaterhouseCoopers. Currently he occupies management positions in private companies and participates in the management of non-profit organizations. Nikola Hristovich is a Certified Management Consultant. Tanya Tsvetkova is Executive Director of Regional Agency for Economic Development – Blagoevgrad and Member of the Managing Board of Public Charity Fund – Blagoevgrad. She was Chairwoman of Bulgarian Association of Regional Development Agencies.